Showcase your love of clean lines and classic color schemes in your backyard with the Heartwood White Gables Bird House. This unit, with its square base and pitched roof, creates an elegant and lovely home for backyard birds, and brightens your setting as well. The all white body captures attention, and its beadbord-inspired detailing around the unit adds dimension. A significant, burnished copper roof covers the home, enhancing its classic scheme, and ventilation slots beneath the overhang of this roof keep the birds from overheating. A recessed section on the front of the home accommodates the 1.5" diameter entrance hole, and a band of copper above this entry highlights the niche perfectly. A copper cleanout panel on the back of the item allows you to remove old nests seasonally, and drainage on the base keeps the roost dry. Place this home on a 4 x 4 post with its included mounting plate, and situate it virtually anywhere in your yard. The durable cypress body withstands exposure to the elements, and the copper roof will remain lovely season after season. 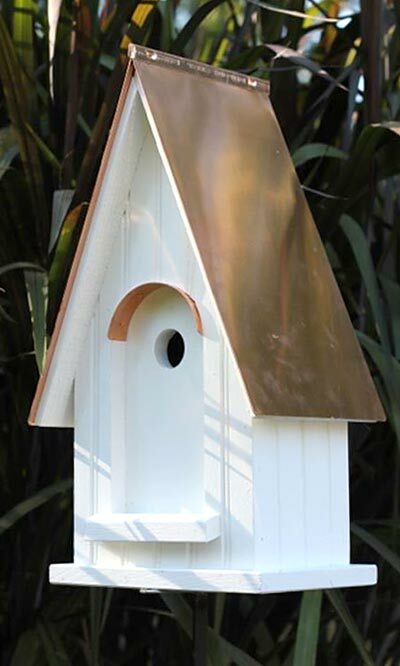 Bring simple elegance to your bird sanctuary with this White Gables Bird House. Made in the USA.